During the course of the year there are a number of pilgrimages that are offered to interested parishioners. Some of these are organised by the parish itself or indeed the diocese. 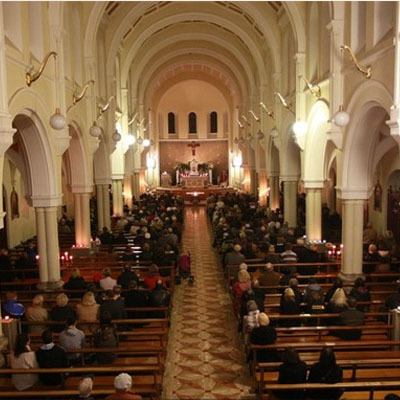 There are other pilgrimages organised by experienced parishioners from both St. Canice's and St. Margaret's. There is a mixture of day pilgrimages (regularly to Knock) and foreign pilgrimages. In the past there have been pilgrimages to Lourdes, The Holy Land, Fatima and Rome. Many of the pilgrimages are indeed very popular and the number of places are often limited. In order to be kept abreast of upcoming planned pilgrimages make sure to read the latest Newsletter. 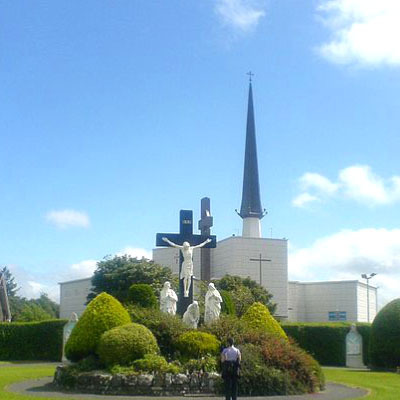 Our Lady of Knock, Queen of Ireland, you gave hope to your people in a time of distress and comforted them in sorrow. You have inspired countless pilgrims to pray with confidence to your divine Son, remembering His promise, "Ask and you shall receive, seek and you shall find". Help me to remember that we are all pilgrims on the road to Heaven. Fill me with love and concern for my brothers and sisters in Christ, especially those who live with me. Comfort me when I am sick, lonely or depressed. Teach me how to take part ever more reverently in the Holy Mass. Give me a greater love of Jesus in the Blessed Sacrament. Pray for me now and at the end of my death. Amen. Young people want their church to be a great place..
Minsters of the Word : Reading at Mass on the Sundays that suit you. 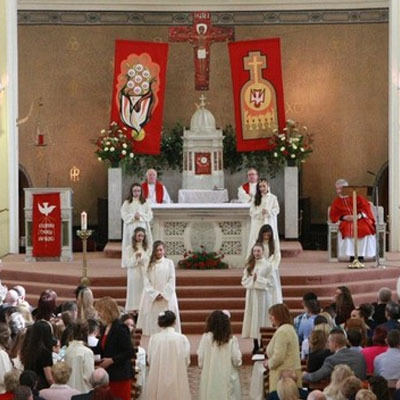 Minsters of the Eucharist : At the masses that suit you. Baptism Team : By rota as part of a team you would meet a family the Tuesday before the Baptism and then again on the Sunday. Folk Group : Practice one evening per week / Thursdays to sing at the Sunday Noon Mass. The Syro-Malabar Catholic Church or Church of Malabar Syrian Catholics is an Eastern Catholic Major Archiepiscopal Church based in Kerala, India and is in full communion with the Pope and the worldwide Catholic Church, with self-governance under the Code of Canons of the Eastern Churches. The Syro-Malabar Church is headed by Major Archbishop Mar Cardinal George Alencherry of the Archeparchy of Ernakulam-Angamaly in Kerala, India. The name Syro-Malabar is created from the words Syriac (referring to the East Syriac liturgy) and Malabar (the historical name for Kerala). The name has been in usage in official Vatican documents since the nineteenth century. The Syro-Malabar Church is the third-largest church (sui juris) in the Catholic Church (after the Latin or Roman Church and the Ukrainian Catholic Church). The Syro-Malabar Church is the largest of the St. Thomas Christians denominations with around 4.6 million believers and traces its origins to the evangelistic activity of Thomas the Apostle in the 1st century. The Syro-Malabar Church members are mostly of the Malayali ethnic group and their vernacular language is Malayalam. Various eparchies have opened up in other parts of India and in the rest of the world due to the emigration of members of Syro-Malabar community.